Put simply – CQRS (Command Query Responsibility Segregation) is an architecture pattern that recognizes the fact that it may be wise to separate the database that processes data manipulations from the engines that handle queries. When data retrieval requires special formats, scale, availability, TCO, location, search options and response times, it is worth considering introducing additional databases to handle those specific needs. These databases can provide data in a way that caters for the special needs to special consumers – by offering data in filtered, preprocessed format or shape or aggregation, with higher availability, at closer physical distance, with support for special search patterns and with better performance and scalability. A note of caution: you only introduce CQRS in a system if there is a clear need for it. Not because you feel obliged to implement such a shiny, much talked about pattern or you feel as if everyone should have it. CQRS is not a simple thing – especially in existing systems, packaged applications and legacy databases. Detecting changes and extracting data from the source, transporting and converting the data and applying the data in a reliable, fast enough way with the required level of consistency is not trivial. In many of my conference presentations, I show demonstrations with running software. To better clarify what I am talking about, to allow the audience to try things out for themselves and because doing demos usually is fun. And a frequent element in these demos is Twitter. Because it is well known and because it allows the audience to participate in the demo. 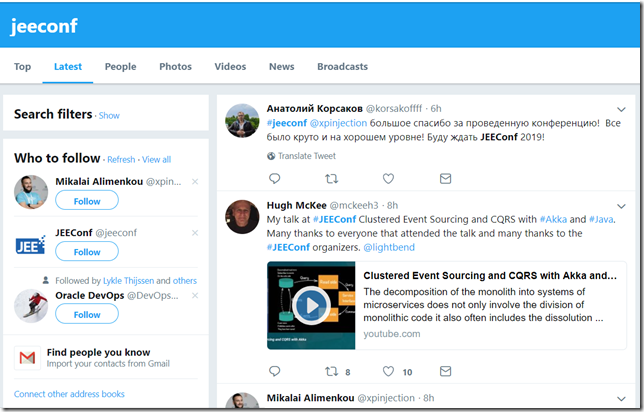 I can invite an audience to tweet using an agreed hashtag and their tweets trigger the demo or at least make an appearance. In this article, I discuss one of these demos – showing an example of CQRS. The picture shows the outline: tweets are consumed by a Node application. Each tweet is converted to an event on a Kafka Topic. 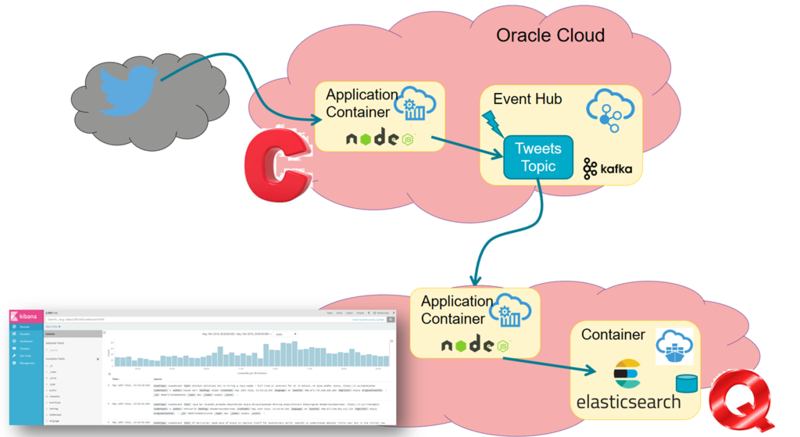 This event is consumed by a second Node application (potentially one of multiple instances in Kafka Consumer Group, to allow for more scalability. This Node application creates a new record in an Elastic Search index – the Query destination in this little CQRS spiel. The out of the box dashboard tool Kibana allows us to quickly inspect and analyse the tweet records. Additionally we can create an advanced query service on top of Elastic Search. This article shows the code behind this demo. 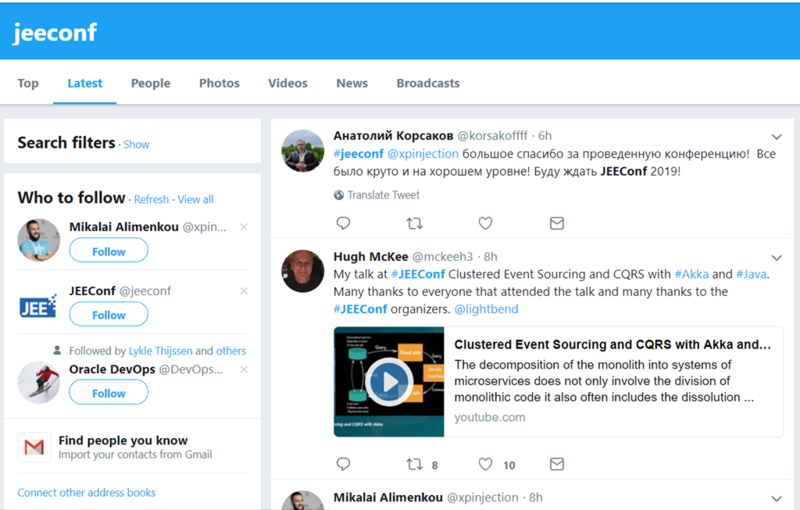 This code as prepared for the JEEConf 2018 conference in Kyiv, Ukraine – and can be found in GitHub: https://github.com/lucasjellema/50-shades-of-data-jeeconf2018-kyiv/tree/master/twitter-kafka-demo . After completing the wizard, the topic is created an can be accessed by producers and consumers. The index.js file requires the npm libraries kafka-node and twit as well as express and http for handling http requests. , "isARetweet": tweet.retweeted_status ? "y" : "n"
Preparation of an Elastic Search environment is done through REST API calls. These can be made from code or from the command line (using CURL) or from a tool such as Postman. In this case, I have created a Postman collection with a number of calls to prepare the Elastic Search index tweets. "format": "EEE MMM dd HH:mm:ss ZZ yyyy"
The custom aspect of the mapping is primarily to extract proper creation date time value from a date string. The tweetListener.js file contains the code for two main purposes: handle HTTP requests (primarily for health checks) and consume events from the Kafka Topic for tweets. This file requires the npm modules express, http and kafka-node for this. It also imports the local module model from the file model.js. 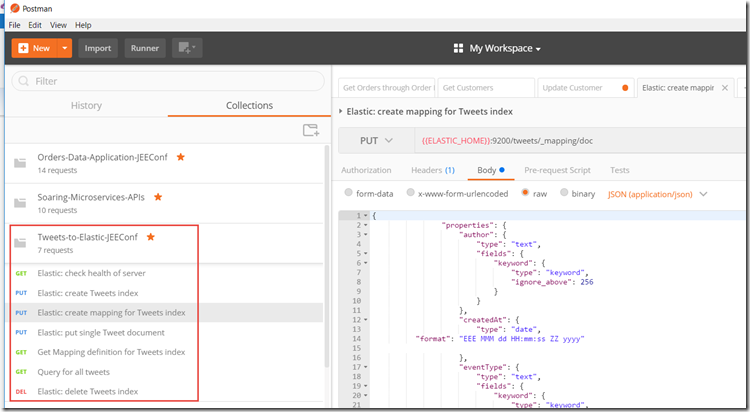 This module writes Tweet records to the Elastic Search index. It uses the npm module elasticsearch for this. The file model.js connects to the Elastic Search server and saves tweets to the tweets index when so requested. Very straightforward. Without any exception handling, for example in case the Elastic Search server does not accept a record or is simply unavailable. Remember: this is just the code for a demo. 5. Kibana dashboard on top of the Tweets Index.